The Mortal Kombat XL Gamepack for Titan One features all Character Fatalities, Faction Kill as well as an Auto Test Your Might mode. All together there are 107 fatalities in total working along with the five faction kills. Fatalities are special finishing moves that can be used against one's opponent at the end of the final round. When the announcer says "Finish Him" or "Finish Her", the player can choose to kill him or her using a Fatality move. These fatalities require certain distances between the player and his or her opponent as well as quick button sequences in order to achieve the desired result. Every character has their own special Fatalities that must be performed at precise distances from the opponent. If input correctly, the background will darken and the Fatality will be performed. 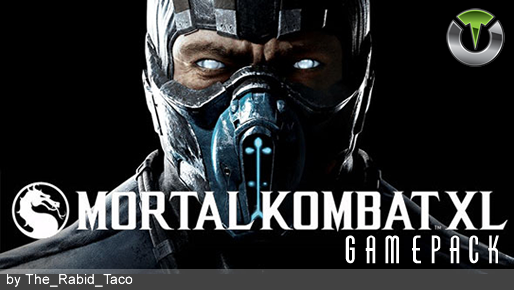 Additionally, Mortal Kombat XL also features a Custom button layout and "Test Your Might" mode where you have to rapidly and repeatedly press all four move buttons on the controller to build up strength to break an object placed in front of your character. The Mortal Kombat XL Gamepack allows the player to complete ALL of these challenges by simply holding 2 buttons down. You can configure up to 4 shortcuts to fast changing between your favorites Characters. Check the Gamepack Configuration section below to see how to configure each shortcut. If the shortcut does not have a character configured then LED 1 will light up after releasing the Select (Back) button, meaning no character is selected. 1. Win 2 rounds and wait for "FINISH HIM/HER". 2. Move your character (left/right) until he/she is touching the opponent. This will point to the Gamepack what direction your opponent is. Classic Fatality if one exists, otherwise does nothing. Player 3 LED and player 4 LED will blink the number of the currently selected character. Dualshock 4: If Purple blinks 1 times and Green blinks 8 times, the selected character is 18. Dualshock 3: If LED 4 blinks 2 times and LED 3 blinks 1 time, the selected character is 21. XBox 360 Controller: If LED 3 blinks 1 time and LED 4 blinks 5 times, the selected character is 15. If there is no LED blinking means NO character is selected (00). To add +10 from current character number. To subtract -10 from current character number. To add +1 from current character number. To subtract -1 from current character number. Changing characters from the menu will reset the character to the one chosen if on a quick slot. The quick slot characters will not change and can be re-accessed using the correct button presses easily. In menu mode hold R2 (RT) until all LED be off. To save the current character selection into shortcut 1. LED 1 will blink 3 times. To save the current character selection into shortcut 2. LED 2 will blink 3 times. Holding down RS / R3 = Runs the easy test your might. When circle small enough press LT / L2 or RT / R2 to finish the test your might challenge.